The Boulder City girls volleyball team has advanced to state final­ four tournament for the fourth time in five years, despite not winning the Division 1­A Southern Region championship Friday. Boulder City lost to Faith Lutheran 25-­12, 25-­15, 25-­23 in the Southern Region championship played at Legacy High School. But both the region champion and runner­-up advance to the state tournament, which will be played Friday and Saturday at Green Valley High School in Henderson. They will play opponents from Northern Nevada. In one state semifinal match, Boulder City (22-­10) will play Northern Nevada’s No. 1 seed, Dayton, at 2 p.m. Faith Lutheran (25-­12), a state semifinalist a year ago, is Southern Nevada’s No. 1 seed and will play Northern Nevada’s No. 2 seed, Truckee, at 3:25 p.m. The championship final is Saturday at noon. The Crusaders have won 39 straight sets against in ­state competition dating back to Sept. 25 and have won 18 of their past 19 matches, including two against Boulder City. 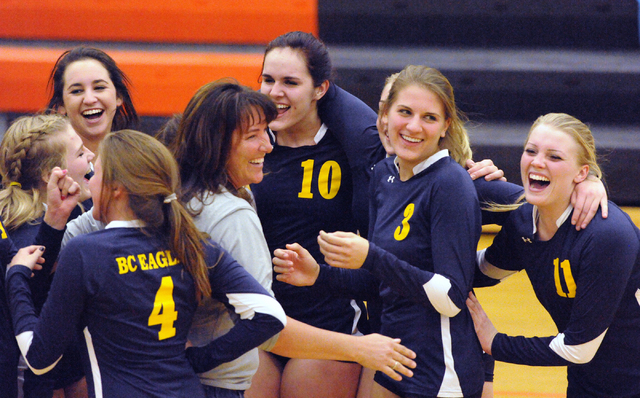 The teams could meet again in the state tournament, but only in the championship match. Against the Crusaders, senior Whitney Barlow had 20 kills to lead the Lady Eagles, while senior Kendall Miller had 31 assists and junior Alyssa Ybarra added 16 digs. An ace by Ybarra gave the Eagles a 17-­16 lead in the third set en route to a 20-­19 lead. But before the Lady Eagles could come back, the Crusaders closed out the match. Boulder City had assured its state berth with its 25-­16, 20-­25, 25-13, 30-­28 victory against Pahrump Valley in a region semifinal victory Nov. 7 at Chaparral High. Boulder City last reached a state tournament in 2011, when it lost the championship match to Truckee. The Lady Eagles last won a state championship in 1989. They also won in 1980, 1979 and 1977. This season marked the 17th consecutive year that the Lady Eagles reached the playoffs. Although not satisfied with the region result, the Lady Eagles can find comfort knowing they have a chance to play for the state championship. A year ago, as the No. 1 seed, they were upset in the region semifinal by Chaparral, which went on to reach the state championship match. Against Pahrump Valley, Barlow had 28 kills as the Lady Eagles jumped out early and dominated. Miller had 35 assists and Kaylin Koltyerhan added 23 digs. Pahrump Valley ended its season with an 18-­16 record with two losses to the Lady Eagles. 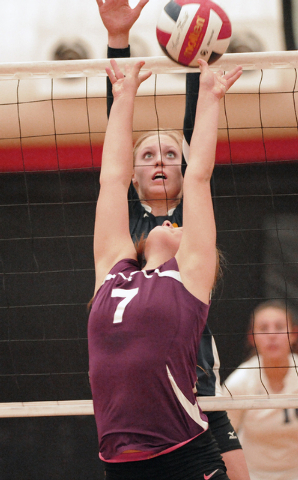 The Crusaders reached the region final with a 25-­11, 25­-9, 25­-8 win over Clark (14-­13) in the semifinals on Nov. 7.